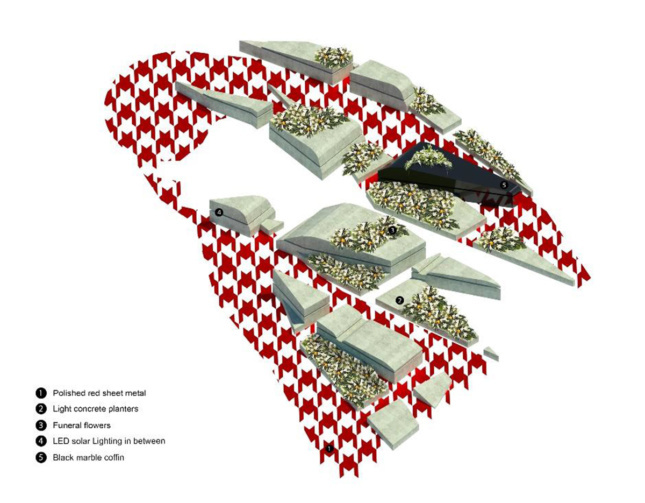 A Turkish-American architect has designed a speculative funeral memorial for the late Jamal Khashoggi. 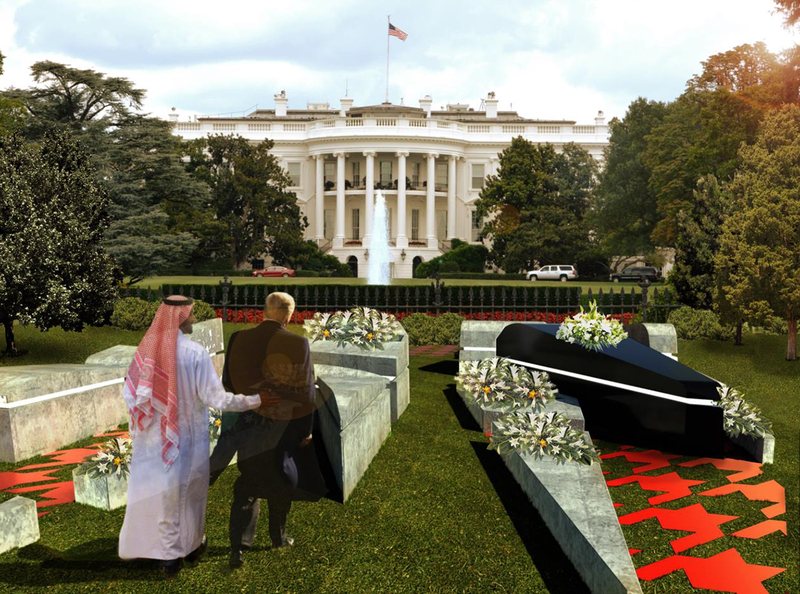 In an immersive sketch, Selim Vural, owner of the Brooklyn-based Studio Vural, envisioned a traveling memorial for the Washington Post journalist who was allegedly murdered while visiting the Saudi Consulate in Istanbul this October. Vural places the memorial in front of the White House in Washington, D.C., as a nod to President Donald Trump’s business links with the suspected murderer, Crown Prince Mohammed bin Salman of Saudi Arabia. 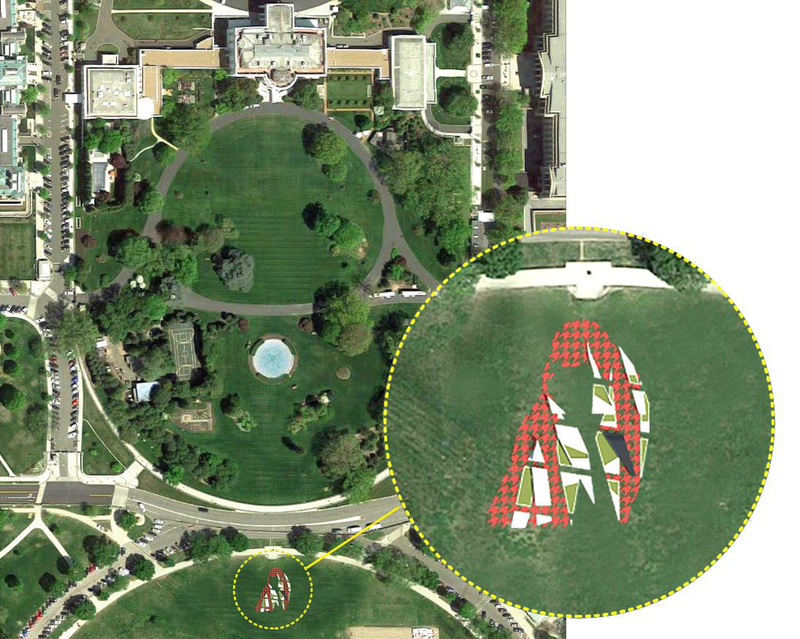 An axonometric view of the memorial shows the design arranged in the outline of a keffiyeh, traditional Arab headgear, overtop green grass. Made with a pattern of polished red sheet metal, the layout references the specific keffiyeh that the Crown Prince wears. 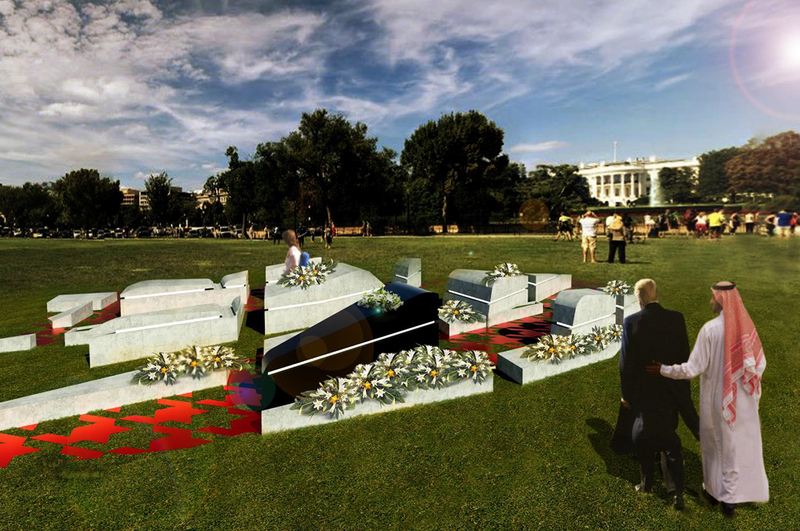 Layered on top of the metal are concrete planters, funeral flowers, and a black marble “coffin” (also a planter), rounding out a makeshift memorial that pays homage to a man who can’t be properly mourned or buried due to his missing body. In the renderings, Vural depicts the Crown Prince walking with Trump, observing the memorial which sits in front of the president’s home. The pointed planters lie in stark contrast to the round and skinny colonnade that accents the White House’s southern central facade. According to the architect, this funeral memorial aims to “bring serenity, calm, and closure to the violence and secrecy of the act” of Khashoggi’s killing. It’s designed for him, but for all journalists—“heroes with pens,” as Vural noted. Last week the Committee to Protect Journalists released a report that found that at least 53 journalists had been killed worldwide in 2018. Since Khashoggi’s gruesome death was one of the most high-profile murders of the year, it’s sparked international outrage and caused potential trade tension between the United States and Saudi Arabia. The latest headlines detail that Trump doesn’t plan to punish the country for the crime in an attempt to maintain the country’s long-held support for America’s foreign policy priorities, but growing global and domestic opposition to the Crown Prince may soon force Trump to change his outlook.